There are many customs and trends which have their affiliation with the non-Muslim culture and lifestyle. Many Muslims, due to being afflicted with what appears to be a truly insecure and inferior complex, look towards and choose the customs and trends of the non-Muslims over that of the beautiful sunnah. It seems as if the need is to secure a kind of acceptance in a non-Muslim society and just blend in with them – so that we are not recognized as Muslims. Bridal Showers and Baby Showers have unfortunately become ingrained in the Muslim lifestyle, just as much of the rest of the non-Muslim lifestyle have become ingrained. Many may ask: What’s wrong with giving gifts, congratulating the bride-to-be or the new mother, or having a get together with friends? There is nothing wrong with giving the bride or the new mother a gift, or congratulating the person. To give a gift and congratulate are from the teachings of Islam – and would draw rewards… but there are conditions to be met in even these noble deeds. What is extremely wrong and objectionable is the background to these good deeds. They are not within the parameters of sharee‘ah. The picture of a typical bridal shower and baby shower is not typical with the sunnah. It is typical of the non-Muslim way of life. By following suit, we fall into the sin of “Tashabbuh bil Kuffaar” (emulating the disbelievers). It is aligning oneself with those who have rejected Allah Ta‘ala, who live their lives in immorality and disobedience. Nikaah is a great ‘ibaadah. Pregnancy and the birth of a child also have their requisites in Islam. However, the West has commercialized all of these noble occasions, and made them into money-making events. The sacredness of these occasions is forgotten. Today, nikaahs have taken on a distinct mould of a Hollywood or Bollywood style wedding – where the bride is dressed to look like a Christian bride or a Bollywood actress – with no sign of Islam on her; and the groom is dressed in a suit and tie, looking like a typical Christian groom. Adding insult to injury is the extravagance and open sin at the time of the wedding and waleemah. One’s mind moves in the direction of the millions and millions who are suffering famine and starvation, who have no home, no water, no food, no clothing – but the Muslim ignores all that suffering just for some fleeting attention and praise. All those hundreds of thousands of Rands wasted on draping a hall, on dressing the chairs, on wine glasses, on musicians, photography, on wedding cards that are thrown away, etc., is money which could have been the means of alleviating the plight of so many suffering people. One brother handed me an elaborate invitation card for his daughter’s wedding. I enquired as to the cost of the wedding card, and was told that each card cost R50. Advising him, I told him that almost all people throw away wedding cards. People generally dispose of them. So he should regard that as people throwing away hundreds of his R50 notes. Would he throw R50 notes into a bin? No. However, the throwing away of those cards is equal to throwing away R50 notes. That same money could have been used in making the Aakhirah. We have a perfect sunnah – a perfect way of life in the life of our Nabi (sallallahu ‘alaihi wasallam) and in the lives of his companions, men and women. We have what is superior to all other cultures, yet we consider what everyone else has. It shows great weakness if we give preference to the culture of the Christians, Jews and idolators over the noble sunnah of Rasulullah (sallallahu ‘alaihi wasallam). We are exchanging diamonds for stones… and what an unprofitable exchange this is! What a great loss! Nabi (sallallahu ‘alaihi wasallam) said: “Whoever emulates a nation is from amongst them.” In another hadeeth it is stated: “A person is with whom he loves.” Nabi (sallallahu ‘alaihi wasallam) also said that we will be raised on the Day of Judgment with those whom we imitate in this worldly life. (May Allah Ta‘ala save us from such disgrace and humiliation.) 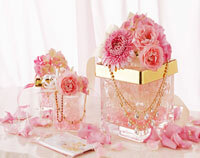 Emulating the non-Muslim culture is one downfall but there are many more that are found in the Bridal and Baby Showers. The non-Muslims have coined a novel concept of begging – especially amongst the upper-class. It seems as if some, from amongst the wealthy, have developed an art of begging. They even have a name for it. In the name of Bridal Showers, Baby Showers, Registries, etc., people gracefully and politely extend their begging hands, and they ask and take from others. A person is forced to purchase gifts that the bride has chosen – which may be beyond her budget in spending. A person who gives something simple or inexpensive will feel ashamed and embarrassed, considering the manner in which gifts are being received and shown to others. The hadeeth encourages giving gifts because giving gifts creates mahabbah (love). If mahabbah is not created, then this proves that either the giver or receiver in insincere. Sometimes, people give with intentions other than expressing their mahabbah. However, there are many who request or are desirous of receiving and there is a kind of greed from the receiving side. This request or expectation (ishraaf) reveals insincerity from the one who is receiving. A gift must be given happily and willingly – and should be received graciously and thankfully. This is the sunnah. However, when we ask of people, as in the case of registries, etc. – people will give, but they give unhappily and unwillingly. And if some gift is given, which is not to our liking, then we receive it without any appreciation and thanks. This is our lamentable condition. A bride-to-be is known for her modesty and shyness – but all of this is lost in adopting the culture of the non-Muslims. Their dressing and their fashion nurtures immodesty. Added to this, these sins are publicized and photographs are taken and uploaded on social media – for all and sundry to view the level of our degeneration. The heart bleeds at this miscarriage of the sunnah… Nay, this abortion of the sunnah. How will we meet our Beloved Nabi (sallallahu ‘alaihi wasallam) on the Day of Judgment? How will we show our faces to the one whose entire life was sacrificed so that today we be the reciters of the kalimah? May Allah Ta‘ala have mercy upon us, since we stand to lose a great deal by adopting this culture. If we continue in this line and direction, we will lose the pleasure of Allah Ta‘ala and we will lose the great rewards for enlivening and practising the sunnah. We also stand to lose the companionship of Rasulullah (sallallahu ‘alaihi wasallam) at the fountain of Kauthar on the Day of Judgment and even stand to lose the success of our marriages due to having sacrificed the beautiful, noble sunnah by means of our emulation of the Hollywood and Bollywood culture. If our allegiance is to Allah Ta‘ala and His Rasul (sallallahu ‘alaihi wasallam), then there should be no delay in repenting and mending our ways and coming back to what is pure and beautiful – Islam and the sunnah. In this is the success of both worlds. May Allah Ta‘ala grant us the understanding, the concern and the taufeeq (ability) of ‘amal (practice).